Would your local watershed get a 'B' for water quality, or a 'C' for forest health? The 2007 Ausable Bayfield Conservation Authority Watershed Report Card summarizes the state of the water quality and forest conditions for 16 watersheds that drain into the south-east shore of Lake Huron. The A, B, C and D grades may capture our attention but the real value of the Watershed Report Card is to provide recommendations on how to improve our local environment. Improving water quality and local forest conditions involves a number of approaches however, the most essential activity is to focus on your own property and identify and prioritize key actions. 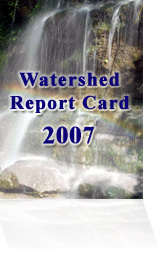 In all watershed report cards, there is an action item for individuals to refer to their appropriate stewardship guide. Farmers are referred to the Environmental Farm Plan and other rural residents are referred to either the Stewardship Guide for the Lake Huron Coastline (2006) or a Rural Non-Farm stewardship guide for watersheds along the south-east shore of Lake Huron. Use the text links below or the map to locate reports for specific watersheds. All documents are Adobe PDF format. Each link will open a new window in your browser.